There’s are a small amount of processed foods that don’t really taste much better or make a big difference when you make them from scratch at home. Sausage Rolls do NOT follow this rule. I’m not a sausage roll fan, but god am i one of these sausage roll fans…along with anyone I’ve given a sampling to. Two things that make these sausage rolls so tasty is the crispy flaky pastry and the strong combination of the red onion marmalade with the thyme. I think these would go down a cracker at a party as something nibbly with drinks… preferably a good ale. If you haven’t already, begin by preparing your onion marmalade and letting it cool. Meanwhile, preheat your oven to 200°C or 400°F and cover a large baking tray with baking paper or a silicone sheet. Place the sausagemeat, chopped thyme, salt and freshly ground black pepper into a large bowl and mix thoroughly… i find it it good to get your hands right in there and mush it all together. When the pastry is ready to use, make sure it’s come down to room temperature and isn’t too firm before use. Place your sheet of pastry onto a lightly floured counter and roll out to a rectangle about 36cm x 30cm. Cut into 6 even rectangles, depending on how large small you would like your rolls to be. Spread a tsp amount of onion marmalade onto the pastry leaving a gap at the top and at the bottom. On the bottom end of the rectangle place about 100g worth of the seasoned meat, then wet the top part with a little bit of water and roll up the sausagemeat in the pastry. Place onto the lined baking sheet with the seam underneath. Repeat with the remaining sausagemeat and pastry. 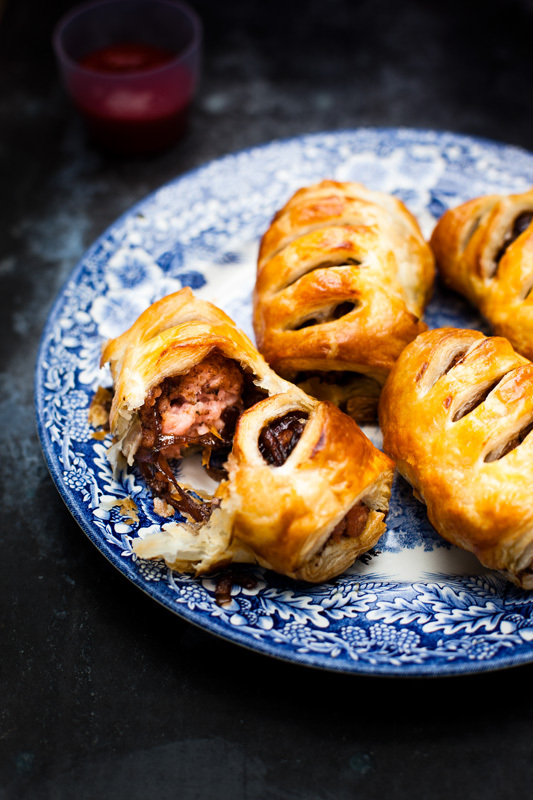 Brush each sausage roll with the beaten egg and slash each sausage roll on the top a few times. Cook for 30 – 35 minutes or until the pastry is golden-brown and the sausage is cooked through. Devour warm or even cold. Oh my goodness. Your recipes and the photography always blows me away, it’s like a page out of a recipe book or magazine! These sound absolutely delicious and would be great served at a Nigella-esque party, with other “posh” nibbles 🙂 And I really want to try your onion marmalade recipe, nom nom nom! I think i might hold a party just to throw these out at it. OK. So, I’ve made puff pastry before and it did not turn out well. It was a gastronomic, mental and social disaster. But I’m willing to try and I’ve been looking for a good project. These rolls seem perfect for it…in fact better than perfect. One of my favourite pastimes whenever I go back to London, is to spend summer in front of a ManU football matches with friends, chilled beer and sausage rolls…from Greggs, no less. P.S. :- And may I add, that your photography is puh-fect. Haha cheers… and you’re totally right this is some gooood football grub. Thanks for the nice comment Amritta!